If you’ve ever found yourself exhausted by this whole “standing upright” business, aka life, you will appreciate the message of The Fall, a contemporary dance piece performed by Frog in Hand at the 2018 Toronto Fringe Festival. Choreographed by Colleen Snell, also Frog in Hand’s artistic director, the show notes describe the piece as a study of “the influence of gravity, exhaustion, control and loss of control.” Fifteen dancers perform half a dozen pieces, some of which are set to music, some to recorded text, and some to nothing at all. The large ensemble of dancers is made up of both established and emerging members of Snell’s company. Without a program (Snell reads the dancers’ names aloud before the performance), it’s hard to single out any particular performers, though I’m happy to report they were all strong in terms of both commitment and dance technique. The gym at Trinity-Spadina Church is an ideal seating for this athletic performance. The performers add to the site-specific aspect by wearing what appears to be old-fashioned intramural outfits as they move around the gym floor. The only set piece is a thick gym mat that they move around, under, over, and seemingly through. There were a few stand-out moments for me. I especially liked the two pieces set to recorded monologues, as I thought the choreography matched the words nicely – which referenced feelings of falling, isolation, or loss of control. I also enjoyed the final musical piece, which was a good showcase for the stamina of the entire ensemble. There were a number of partnered pieces that showed a nice sense of tension between the two dancers involved. And finally, a piece in which one dancer is trying to “break through” to the other side of the mat where the rest of the company is works well with the show’s overall message. Seating is somewhat limited at this venue, and you could end up sitting on the floor so I suggest arriving early if you’re not as limber as the young performers in The Fall. 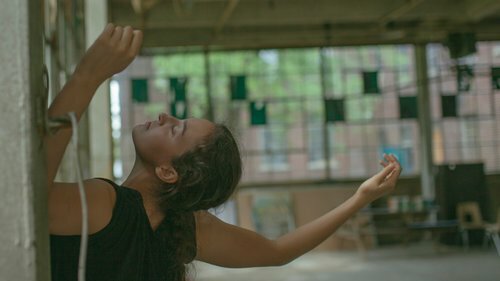 This 45-minute energetic dance piece will be a refreshing addition to any Fringer’s schedule. The Festival reports that this venue is wheelchair-accessible. Photo of Madeline Wright by Alvin Collantes.